FILE - Terry Anderson holds an American flag presented to him while sitting with his sister Peggy Say during a ceremony in his honor at Dulles International Airport in Chantilly, Virginia, Dec. 12, 1991. Say died at age 74, Dec. 23, 2015. Peggy Say, who spent nearly seven years on a tireless quest for the release of her brother, journalist Terry Anderson, and fellow hostages from kidnappers in Lebanon, died Wednesday. She was 74. Anderson, the chief Middle East correspondent for The Associated Press when he was abducted from the streets of Beirut in 1985 in the midst of the country's civil war, said his sister died Wednesday after a long illness. She had been living in Cookeville, about 70 miles east of Nashville. A self-described housewife, Say quickly became her brother's most prominent public champion, keeping his fate and that of the other hostages in Lebanon in the public eye as the years went by. "We were allowed a radio from time to time, and we did hear about her efforts and the efforts of other hostages' families on the radio, and of course it was always a great comfort," said Anderson, who was held by the pro-Iranian Shi'ite Muslim militant faction Islamic Jihad for 2,454 days. 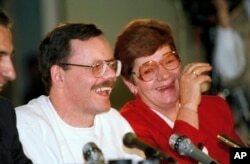 FILE - Former U.S. hostage Terry Anderson, left, and his sister Peggy Say are shown during a news conference in Wiesbaden, Germany, two days after Anderson was released after nearly seven years in captivity in Beirut, Dec. 6, 1991. Former AP President Lou Boccardi remembered Say as a "remarkable woman" and a relentless advocate. "In a very short time, she made herself into a national figure as the family face of long and frustrating efforts to win freedom for her brother," Boccardi said in an email. "She never took 'no' for an answer." Say's activism wasn't without critics. Some Washington officials at the time contended her vocal approach prolonged the hostages' captivity by compromising behind-the-scenes efforts to free them. "I did what I had to do as his sister," she said on the eve of her brother's release in 1991. "I don't think the United Nations would ever have intervened if we had not kept the plight of Terry and other people alive." She believed it was the U.N.'s intervention that eventually won freedom for the final American hostages. Anderson said Wednesday that one of the first things his sister asked him about upon his release was whether her activism had caused him to be held longer. He said he didn't believe that to be the case. 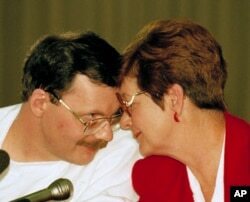 FILE - Former U.S. hostage Terry Anderson and his sister Peggy Say enjoy a light moment during Anderson's news conference in Wiesbaden, Germany, Dec. 6, 1991. "I told her that I was pleased with what she had done for a number of reasons," he said. "One, was to give us hope when we heard about it. And two, that it gave the families a sense that they were actively engaged in trying to do something." Say met periodically with then-U.N. Secretary-General Javier Perez de Cuellar. Her travels put her face to face with Pope John Paul II, Palestinian leader Yasser Arafat, the president of Greece, Syria's foreign minister and an associate of notorious terrorist Abu Nidal. "The worst time for all of us was after the Iran-Contra scandal," Say said in 1991. "People were blaming us, the hostage families, for pushing the administration into it." Anderson, who recently retired from teaching journalism at the University of Florida, said he credits his sister's prominent role in helping keep the hostages alive. "Remember these were very bad guys," he said. "They could easily have killed us, but they didn't. They let us go."